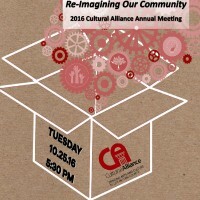 On Tuesday, October 25th at 5:30pm at the Agricultural and Industrial Museum, The Cultural Alliance invites you to re-imagine York with us. What if the conversation around arts in our community was not about what the arts need (money), but about what the arts provide? What if the key to a sustainable, stable York is not something we need to create, but is something we’ve always had-artists? What if the arts are not an add-on or addition to our redevelopment, what if they were the starting point? Event is free, but space is limited.